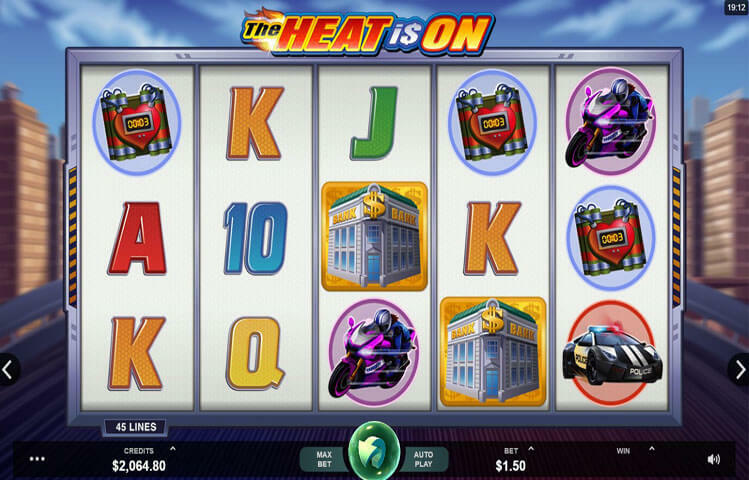 The Heat Is On is the newest game to be released by Microgaming. The game is proving to be quite popular, thanks to its visuals, as well as its theme, and of course, the great rewards and fortunes that the game can offer. The Heat Is On is about a robber and a cop, both are hot females. Players will join them in a game of cat and mouse as the cop tries to stop the robber from stealing money from the bank. Players will get to join these two hot ladies as they get to claim their own share of the fortunes of the stolen loot from the bank. The new Microgaming slot machine has an outstanding visual quality. This does not come as a surprise to anyone since the name behind the game is Microgaming. Therefore, players will get to enjoy an immersive ride that will take them deep into the game of cat and mouse. Players will get to enjoy the hot pursuit and become a part of it for an unforgettable ride. The visuals of the game start with the background of the reels. The reel set is located in the big city where the hot pursuit is taking place. This is why players will see the big city streets with the high rise buildings surrounding the reels. As for the symbols that they are going to see across the reels of the game, they include the hot cop, the beautiful robber and the bank. Other icons include the policewoman’s car, the robber’s motorbike, a helicopter, a bomb and the usual low paying card symbols. Even the sounds that players will hear during the game play are inspired by the theme to offer players an engaging ride. The new game is packed with a lot of bonus features and icons that would make the players’ stay at the game much more rewarding. The first of these special features is the wild. The game does not give players the ability to enjoy 1 wild, but 2 wilds. These two wilds are the two characters of the game, the hot robber and the hot policewomen. These two wilds will replace for all other icons appearing anywhere across the reels of the game. These wilds will not replace each other, nor will they replace the scatter icon. Wilds can also give great line pries when matched, and even a combo of mixed wilds can give a payout. The scatter icon can trigger scatter rewards, in addition to the free spins round. Players getting from 3 to 5 scatter icons will trigger the free spins round. Players can claim more free spins, up to 160 free spins. The scatter is the bank symbol.